I love Tiffany's, but more than anything, I love their Little Blue Box (I even have a ceramic one!). My friend Jana at tPF did a great Tiffany blue polish comparison that I am so excited to share. I only own For Audrey and Mint Candy Apple, so it was really useful to see how Oh Tif and Greenport looked next to them. Thanks for the great comparison shots Jana!! So readers, which one is your favorite Tiffany blue? For Audrey is the best Tiffany I think but Greenport is a great color! I am waiting for a "mail haul" bringing Oh Tif and For Audrey.....I have my little blue box ready!!! nice swatching. 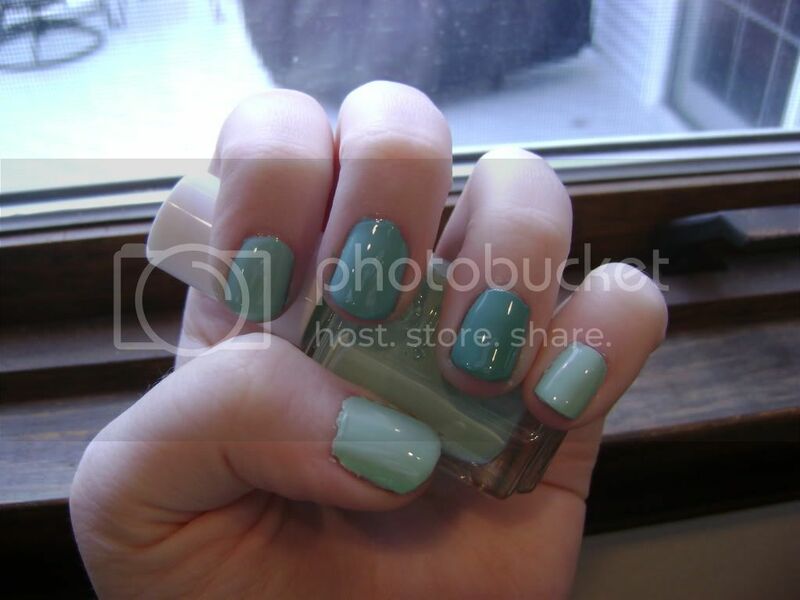 I'm really down with Essie Greenport...gaah! Where do you all buy these in the states? They're near impossible to get in Canada and I have to order everything online. Niki*, I snagged Greenport on ebay when it first came out. I think you can get it on amazon still now though. yardsticks, I think Oh Tif looks really gorgeous - I can't wait to see a full mani when you get yours. Niki, I believe Greenport is still available at transdesign too. Thanks again for the great swatches Jana!! Thanks a lot for the comparison. These blue colors are great and gorgeous! Essie Billionails - it worked! Incognito - my first first brown polish! Guest Polisher - Taupe Overload! Hungary for my Honey and honey beer bread! Nailene - More French Manicure Fun! Nailene - French Manicure Fun! Avatar - yeah, I LOVED it! Gradient Nails - I tried it! Revlon MangoZING and YIKES marbling!